If it’s time to splurge on a new-to-you Certified PreOwned luxury vehicle, Jaguar Colorado Springs is the perfect place to go! 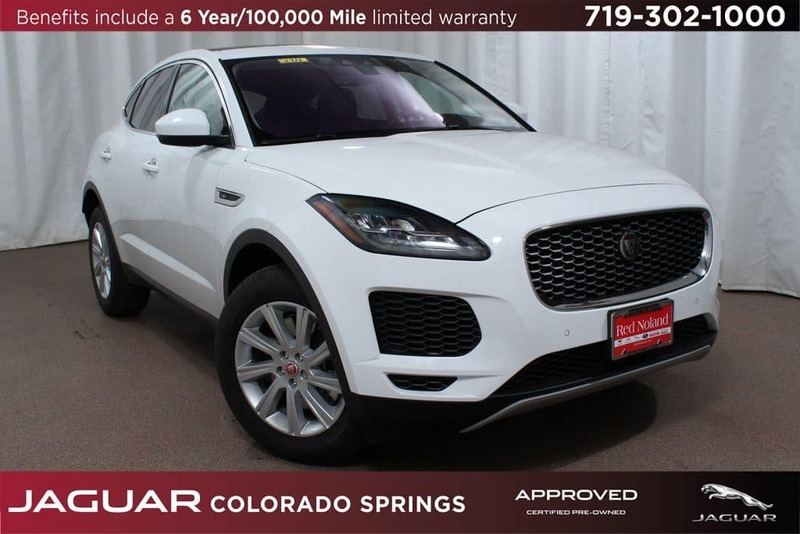 We currently have this gently used CPO 2018 Jaguar E-PACE SUV in our inventory, and it is priced at under $43,000! Equipped with a 2.0L turbocharged engine and paired with a 9-speed automatic transmission, you can expect an estimated 21 MPG city/28 MPG highway fuel economy. Plus, with only 3,000 miles driven, this gently used performance SUV will provide you with enjoyable driving experiences for many years. Some of the other features you can enjoy include heated windshield with heated washer jets, InControl Navigation Pro, low tire pressure warning, and rearview camera. This E-PACE also offers passive entry push start, 10-way heated seats, and a Meridian 380W Sound System. Plus, at a Certified Pre-Owned Jaguar you get the added benefit of a 6-year /100,000-mile (whichever comes first) warranty. There is so much to love about this compact SUV! So, stop into Jaguar Colorado Springs today to take a test drive. We are sure you will quickly appreciate that the 2018 Jaguar E-PACE is the perfect vehicle for you!